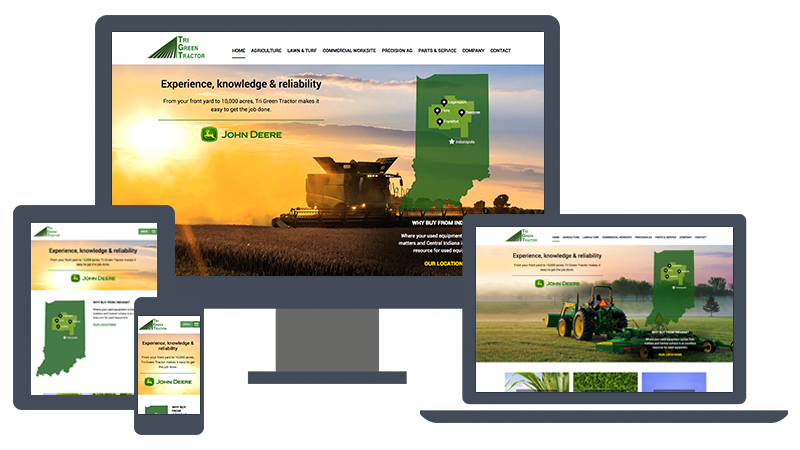 Tri Green Tractor came to TBH Creative with a common problem: an outdated website that was not effectively communicating with their audience. Instead of supporting their brand and sales efforts, the website was detracting from their work. Tri Green Tractor had started to attract a new audience that wasn’t just regional to their locations - farmers searching for used equipment from Central Indiana where the soil produces less wear and tear on the machines. The website needed to be upgraded to better meet the needs of this target market. Our goals were to attract new customers, better communicate the depth and quality of their products and emphasize their location, knowledge and service as key differentiators. Perhaps the biggest twist to this project was creating a website that talked to both regional and long-distance prospects. Historically, Tri Green Tractor has been known as a strong regional resource for farming machinery. In discussion with their key customers we heard time and time again about how people liked working with Tri Green Tractor because they knew the people there. Their customers have personal relationships with them for both purchases and maintenance. A farmer’s machinery is critical to their business and the relationships they built with Tri Green Tractor along with the high level of service they received on their machines were what set Tri Green Tractor apart. The new audience target will never have that sort of personal relationship but they need to understand there are good reasons to purchase equipment from Tri Green Tractor. Location matters when it comes to used farm equipment and Tri Green Tractor want to make sure that people from near and far understand that their used equipment is of excellent quality because of the soil in which it is used. We put a focus on incorporating high quality photos of equipment into the design because they instantly communicate the professionalism and quality of farm machines available at Tri Green Tractor. A new 24-hour service request was added to the site to expedite service issues for local customers. More detail was added to the location pages to help customers from any location reach a Tri Green Tractor representative. We also added links on each page to contact information at various levels so that prospects can easily take the next step and contact Tri Green Tractor. What worked best in this project? Pulling the right people together at the right time was critical to the success of this project. As the project evolved it became clear that we needed more direction from the Tri Green Tractor team. 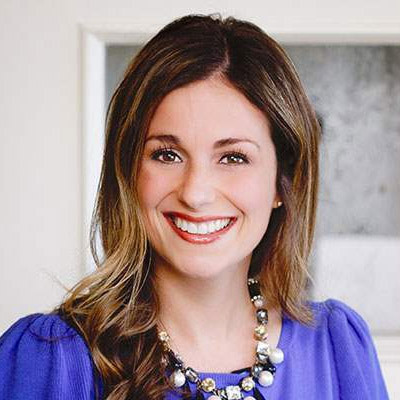 The new website design and calls to action are an important step to reaching out to both their local and non-local audience. The next steps are to focus more on SEO and regularly review website analytics for user trends. 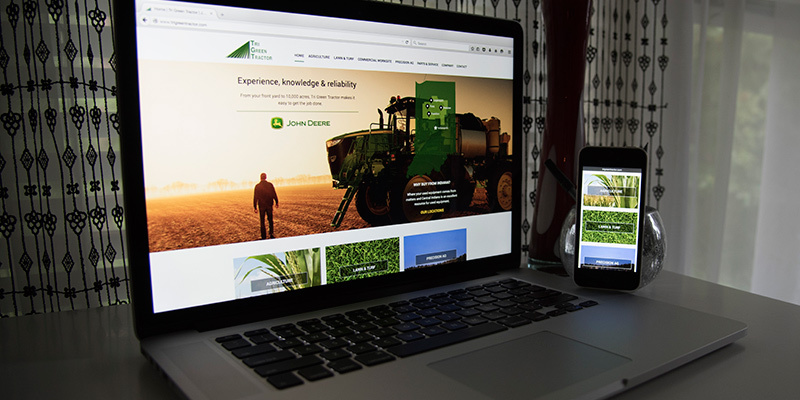 Tri Green Tractors is putting more emphasis on their online marketing and regular updates, monitoring and responses will be key to their continued success. Tri Green Tractor was formed in 2011 from three existing John Deere dealerships in Central Indiana. Today they offer over 150 years of combined experience in tractors, lawn & garden machines, commercial worksite machines and precision agriculture. 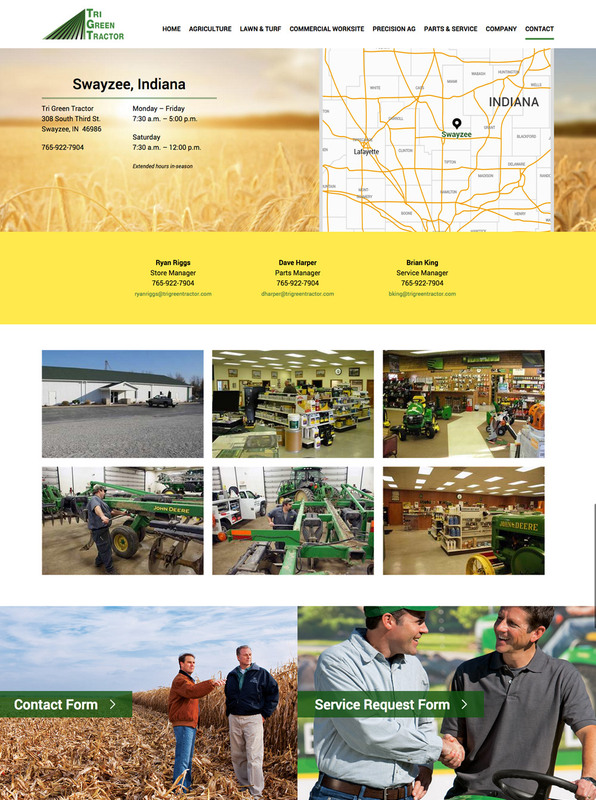 Tri Green Tractor’s staff and leadership stays informed on cutting-edge agricultural products and needs to offer their customers the best experience and the highest quality products. From tractors to healthcare to software to flooring and other industries in between, we look forward to learning about your business and offering successful marketing solutions.